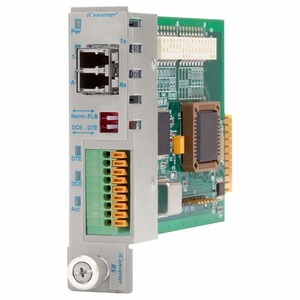 The Omnitron iConverter RS232 is a manageable serial RS-232 to fiber converter that transmits serial protocol over fiber media. Fiber transmission extends the serial signals up to 120km, and is immune from electrical and magnetic interference. The serial port interface is available with either a DB-9 female connector or terminal block connector for field wiring. The RS232 automatically detects the signal baud rate of the connected serial device, ranging from 110 to 921,600 baud. It also automatically adjusts to changes in the connected device's baud rate during operation without reconfiguration or interruption of service.